System Ninja has an extremely simple translation platform, enabling anyone who speaks a second language to quickly translate the program. This article will guide you through the process of translating System Ninja into your own language. If you have a complete translation, please send it to [email protected] so we can publish it*. 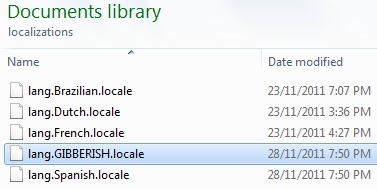 In the “localizations” folder inside the System Ninja directory, create a text file called lang.LanguageName.locale. Replace LanguageName with the name of the language you wish to translate System Ninja into. Open System Ninja and navigate to the Settings window. The language you have created will now be visible in the combobox. Select it, press “save” and close System Ninja. In the “localizations” folder, there is a file called “output_strings.false.” Rename this file to “output_strings.true” (switch false to true) and reboot System Ninja. You will need to use System Ninja intensely for a few minutes to ensure that everything is output correctly. – If your translation contains non-English characters, you must save the *.locale file with unicode encoding, rather than ASCII. – If you need any help, don’t hesitate to get in touch! *Make sure you provide your name with your submission, otherwise we can’t credit you for your effort. Thanks!